The California condor can soar 15,000 feet above the earth. It has a wingspan of up to 9.5 feet—nearly twice your height! 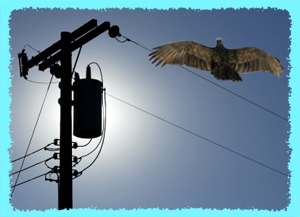 Because of this broad wingspan, power lines are a serious hazard to condors. Small birds can sit safely on one power line. They don’t touch the ground, or any other grounded object, so electricity stays in the power lines and doesn’t harm the birds. Condors, with their broad wingspan, are likely to touch a power line and pole at the same time and become a path for electricity to travel down the pole to the ground. Or, their large wings can bridge two power lines at the same time, creating a short circuit. In either situation, the birds are electrocuted. Condors have a slow rate of reproduction, which is one reason they nearly went extinct. Power line contacts haven’t helped matters. In 1979, only 25 California condors were left and efforts began to save them. Scientists at the Los Angeles Zoo developed a program to train captive condors to avoid power poles before they are released into the wild. A perch that looks like a power pole delivers a mild shock to any bird that touches it. The birds learn to land somewhere else. Most condors that have graduated from the shock training program successfully stay away from power lines. Today, about 395 California condors are living—195 of them in the wild.